I definitely haven’t been loath to willingly, even happily, adjust my expectations when it comes to this show’s music, but, after this episode, rather than accommodating any expectations, I’m beginning to feel that it just isn’t living up to them. 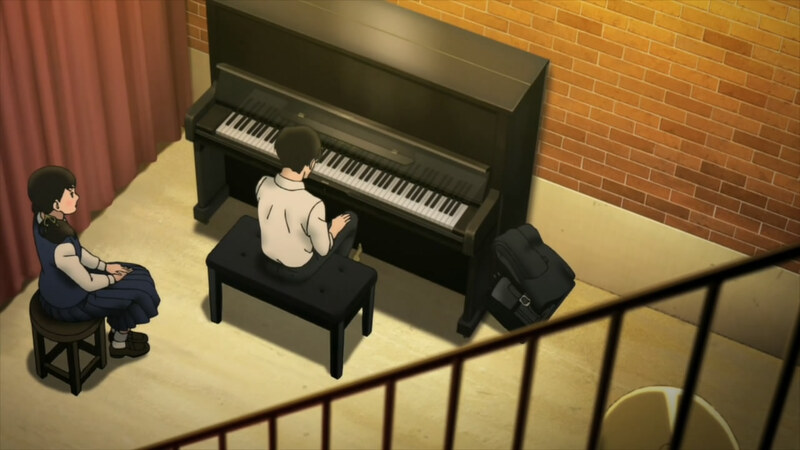 What made Sakamichi no Apollon feel so special in the first two episodes was how intimately the music reflected the characters. The music was an integral part of the narrative, an active member of the story rather than an unavoidable outcome of it, and that was very much the heartbeat of the show. To watch Kaoru grow as a person and to see his interest and skill and jazz grow along with him seemed like a vital part of the yarn. Watching him discover the intricacies of the syncopations and dissonances of jazz as it paralleled him taking root in his new home and learning the ins and outs of the people that live there was fascinating and fulfilling. With this episode, it’s implied that some amount of time has passed. Sentaro and Kaoru are now best buddies, and their sessions in the basement of the record shop have now become their regular after-school activity. What was disappointing to me is that Kaoru is now playing like a professional jazz musician. While it can be assumed that he has gotten a lot better since we last heard him play in episode 2 of Apollon, his playing has gotten so good that it makes his musical journey feel distinctly detached from his personal one, and that’s the discord that let me down. It causes the much-anticipated musical aspect of the show to feel extraneous instead of being integrated to Kaoru’s story. Jazz is now something Kaoru does rather than something that reflects of Kaoru himself. At this point, I feel it has few thematic ties with the plot the way it just organically did before. In short, for the time being, at least, the music in large part has retreated to where I originally expected it to be: in the background. If there’s a glimmer of hope, though, it was definitely in that final scene that everyone seems to be gushing about. The confession itself aside, it was really great to see how hard Kaoru worked on that transcription. Transcribing a jazz piano solo like that where harmony moves at a wink’s pace is nothing to sneeze at, and to see him really working on it to play for Ritsuko said a lot about his character. It still stands, though, that the show in general dropped the ball in terms of its music. I’d like to mention for just a moment Kaoru’s solo tune featured in the episode, “Some Day My Prince Will Come.” If you’ve never heard it as a jazz standard before, you’ve probably heard it in Cinderella, or even as a pop arrangement. After its humorous introduction to the jazz repertoire in a performance in a concentration camp, it’s since become a staple, with artists like Miles Davis and Herbie Hancock doing versions of it. The tune is well known for its flexible harmony despite its conventional chords, but I’m sure you wouldn’t want to hear about that. 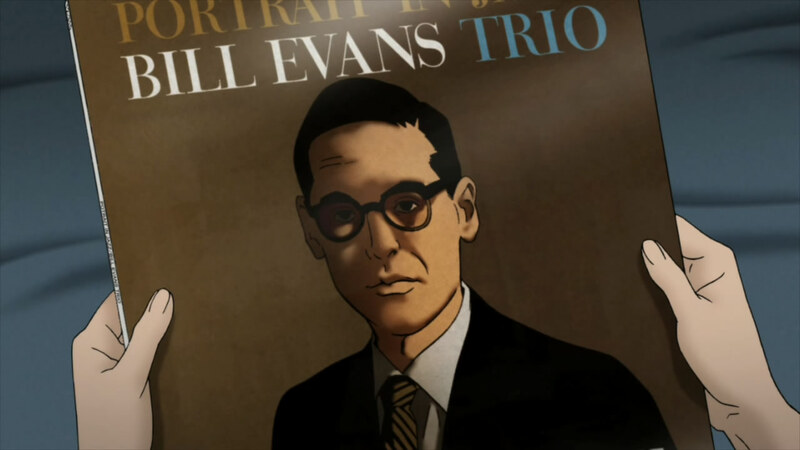 The version Kaoru is channeling in the episode is none other than Bill Evans’s cover of it; Bill Evans is probably one of my favorite jazz pianists and stands as one of the most influential jazz artists of all time. If anything, I did appreciate the way the show tied in the title of the song to what was going on in the plot. In terms of characterization and plotting, though, Sakamichi remains absolutely sterling. How fitting is it that the mythos of the show would have it that two lovers will unite by climbing a slope? Wasn’t it fascinating (if a bit cliché) to see how shy Sentaro is? The glimpse into his home life was intriguing, showing how he’s a big brother with responsibilities. The way it handled the romance genuinely caught me by surprise; I didn’t expect it to turn so dramatic so soon, but it still felt adequately substantiated and unrushed. I suppose that’s the casualty of being great at everything else, is that the music suffers a bit. I’m not asking (nor do I want) the show to be exclusively about music, all the time, but I can’t help but feel the narrative has betrayed its origins a bit. How the show integrates jazz from here will be interesting, if not utterly critical. This week, witness my cliche inclusion of the video every other blog is pasting in at the end of their posts. The confession scene was great, nice to see the love confession not dragging on. However, I’m really enjoying how jazz seems to bring all of the characters together. Either way, I predict it’s going to get very real and emotional from this point on. 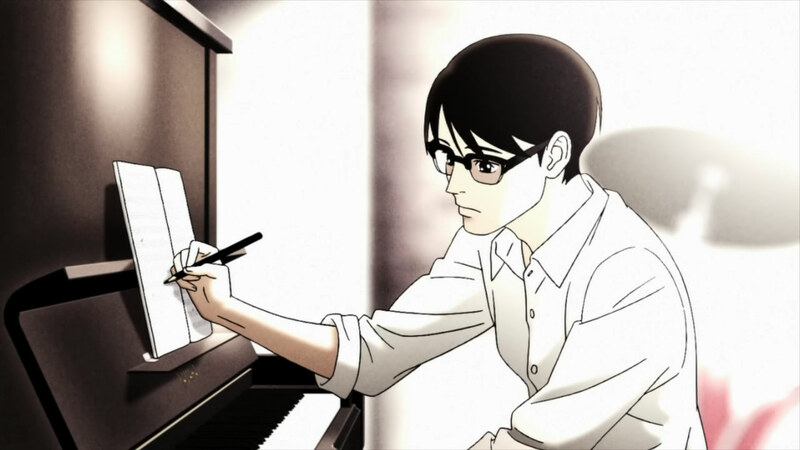 I’m lurking and reading this great series of posts about Sakamichi. Keep up the great work!